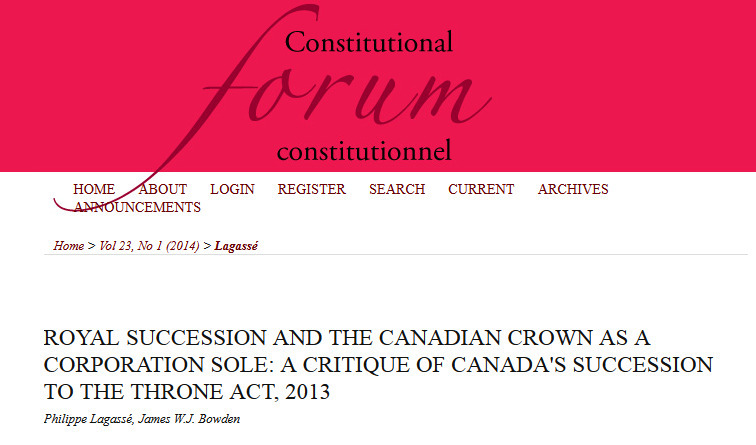 Philippe Lagassé and I have written a short article on the Crown of Canada as a corporation sole and how this fundamental attribute of the Crown pertains to royal succession and section 41(a) of the Constitution Act, 1982. I’d like to thank Patricia Paradis of Constitutional Forum for having published our article, which you can read at the link below. The central point on which the argument rests is the notion that the Canadian Crown exists as a corporation sole separate from the British Crown, and that this must be the case because the Crown-as-corporation-sole is the state, and if the Crown is shared, then so is the state, and we know Canada to be a separate state from the United Kingdom. Therefore, because this must be the case, the Statute of Westminster must have done it somehow. While it is true that the Crown-as-corporation-sole was at one point the notion of the state, this has since evolved. First, as a necessary consequence of Canadian federalism and then as a consequence of equality of the Realms, it became necessary to compartmentalize (not divide) the Crown. This wasn’t achieved by creating a proliferation of Crowns running around as separate offices with separate successions, but instead by formalizing the concept of the Crown acting on behalf of (in Right of) one of its governments. It is this concept, the Crown-as-corporation-sole-acting-on-behalf-of-one-of-its-governments, which has superseded the Crown-as-corporation-sole as our notion of the state. This captures not only the separation between the British and Canadian states, but also the plurality of the Canadian state, as the Crown acts on behalf of its Canadian governments singularly or collectively, in a way which is not achieved by the theory that the Crown was divided into separate corporations sole. It is this division of roles rather than offices to which the ruling concerning who is responsible for the Crown’s treaty obligations to First Nations is referring. Supporting this version of events is the case law surrounding the separate treatment of the Crown in Right of one government or another. Also supporting this is the fact the nobody would be more surprised by the theory that the Statute of Westminster divided the Crown into separate corporations sole with separate successions than the people who drafted it. For surely if that had been their intent, they would have noted it in the Report of the Conference on the Application of Dominion Legislation and Merchant Shipping Legislation, 1929, or at one of the Imperial Conferences. But to the contrary, they seemed to of the mind that they intended to maintain the unity of the Crown and avoid making any constitutional enactments aside from those changes in law necessary to allow for the functional independence and equality of the members of the British Commonwealth. They even set out in no uncertain terms that the authority of the British Parliament over the Dominions would in fact continue by necessity, but that the combination of a rule of construction and a constitutional convention would be sufficient to satisfy the spirit of equality between the members of the Commonwealth, indicating that sovereignty over the Dominions was not, in fact, formally changing hands to newly created Crowns due to a sudden schism is legislative authority. I had a feeling and went back and checked, and it turned out that the 1926 Imperial Conference was used as the justification for why the Crown had suddenly fractured this time around. This is strange, since the 1926 Conference merely strengthened the principle of responsible government in relation to the Dominions, which is hardly the traumatic event you’d expect to cause a shared office of Head of State to fracture into several offices in personal union. Further, in that Conference’s consideration of international treaties, it emphasized that treaties should be written as being made by the King wherever possible, or if they only applied to part of the Empire, made by the King on behalf of that part. Further, it spoke of governments potentially deciding to allow treaties to be negotiated by other parts of the Empire and accepting the result. None of this is the language having a Head of State who occupies separate offices for each country. Further, this language matches that in the 1981 English Court of Appeal case cited as supporting the fracture of the Crown, which is notable for it’s care in always referring to a singular Crown acting with respect to one of its various territories rather than to separate Crowns. While it describes the Crown as having become separate and divided as a result of the 1926 Imperial Conference, it makes it clear that it is the roles and responsibilities of the Crown which have been divided based on the territory to which they relate, and not the Crown-as-corporation-sole itself into separate corporations sole through how it describes this division. It is important to understand that the ‘Statute of Westminster’ did not divide the Crown which is indivisible. The’ Crown in right of Canada or a Province’ is the same Crown as the ‘Crown in right of the United Kingdom’. Canada and its Provinces and Britain are merely different legal and territorial jurisdictions with different Privy / Executive Councils and different Parliaments / Legislatures. The Crown in right of Canada, of Ontario and of Quebec were established on July 1st 1867 via the new Governor General & Lieutenant Governors, and the new Parliament of Canada and Provincial Legislatures. The Crown in right of Nova Scotia and New Brunswick continued as it had existed before July 1st 1867. While the new Dominion of Canada was not an ‘independent’ country — its laws were subject to the Colonial Laws Validity Act, it was nonetheless a country just as was Newfoundland at the time. Independence came through the Imperial Conferences of 1926 & 1930, and the Statute of Westminster, 1931. The fact that the Crown is a ‘non-statutory corporation sole’ does not mean that it is an actual corporation. It merely means that the Crown enjoys all of the legal rights and privileges of a corporation without being one. The Crown is actually two Crowns united into one by King James VI of Scotland in 1603, and the Crowns were founded in 843 (Scotland) and 1066 (England). The Crown is the supreme and sovereign legal entity of and over Canada. The Constitution of Canada (including the British North America Act) is the Crown’s supreme law for Canada. (The Constitution could be repealed, but Canada as a territory would continue to exist under the Crown. If the American Constitution were repealed, the United States would cease to exist since their Constitution is their supreme legal entity.) The British North America Act 1867 through to the Constitution Act 1982 are laws of the Crown enacted in right of the Parliament of Westminster, but they nonetheless belong to the Crown and not the British Parliament. Laws enacted by the Crown in right of the Westminster Parliament have supremacy over Laws enacted by the Crown in right of the Canadian Parliament. Section 2 of the Canada Act 1982 ended any future role for Westminster to make any Laws applicable to Canada, and this Section 2 is what creates the constitutional problem for the Canadian Parliament’s new ‘Succession to the Throne Act’. The 1936/7 Canadian Abdication Acts are not constitutional, and these 36/7 Acts merely fulfilled the requirements of the Statute of Westminster. They’re not relevant to the issue of this new Succession Act. Since I do not support this Clegg Succession Law which is an affront to Royalists as it will destroy the ‘Sovereignty’ of the Crown, I’m very glad that the Quebec Government is challenging it. Hopefully wiser heads will ultimately prevail, and know better than to trust in a stupid idiot like Nick Clegg who is likely a republican. Most of this is wrong, but I don’t have time to write out the explanation here. This is Jacobite Imperial chauvinist rubbish. Just to clarify any confusion in my views: I do not dispute the primacy of Magna Charta as binding Supreme Law of the Crown, and I do not support the attempt by James VII/II to usurp Magna Charta. James VII/II brought about his own ruin. To refer to me as a ‘Jacobite’ is ridiculous. I am nonetheless a Royalist, and I make no apologies whatsoever for bearing true patriot love of Royal Canada which the Father of Canada Sir John A. Macdonald and the Fathers of Confederation have bestowed upon us. You do need to explain your reply Post further, and not throw out accusations. I forgot to mention that there is another constitutional problem with the Canadian Parliament’s Succession to the Throne Act. The Statute of Westminster is part of the Constitution of Canada, and so it must be followed to the letter. However, many of the sixteen Realms have not enacted a Law granting their Assent to the British Parliament’s Succession to the Crown Act which therefore renders the Statute of Westminster process unfulfilled under the Canadian Constitution. All right, I now see where my Original Post caused confusion. 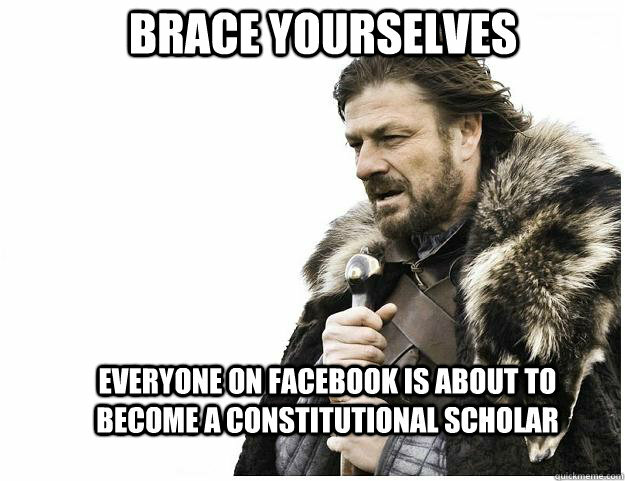 I didn’t mean to say that the 1936/7 Canadian Abdication Acts are unconstitutional. What I merely meant was that those Acts are not part of the Constitution of Canada as defined in 1982. My bad! However, even in 1936 the main Abdication Act was the British Act — not Canada’s Act which was simply consenting to the British Act as required by the Statute of Westminster. If there had been no British Abdication Act, Canada’s Parliament would have had no authority over Abdication. Canada’s role was concurrent and intertwined with the British Parliament’s role. That’s why the Canadian Abdication Acts were not included in the 1982 Constitution. There can only be one Law of Succession, or otherwise you have schism.